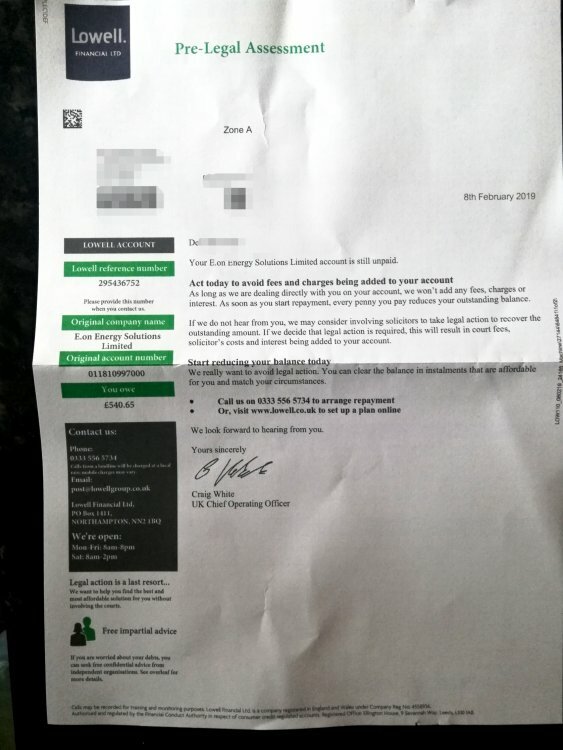 £550 owed initially to EON for utilities at a previous address. Sold to LOWELL PORTFOLIO (i think thats what they are called). They have offered the discount. urm what are a DCA doing with a utils bill? util companies do and succeed in easily getting CCJ themselves at the drop of a hat. they didn't they sold it on. the fact there is a discount also means there is something WRONG [bOGUS] with the debt. is it defaulted and showing on your credit file? It has not defaulted, and it does not show on my credit file. ANd franlkly I thought i had settled all before I moved. please stop phoning DCA's up. Hello bitemarx and I can confirm, we've sold some of our unrecovered debt to Lowell. The sold accounts are all finalised and have had outstanding balances for a fairly long time (up to 6 years old). They've gone through our complete debt collection process but we've been unable to collect the outstanding balances. We'll have written to you to let you know about the sale and what to do next. Lowell will contact you independently by letter. Please deal with them directly as they'll now look after the debt. Contact details are on both ours and Lowell's letters. Should you agree this is a valid debt, you can pay Lowell directly or talk to them about setting up a suitable payment arrangement. If you've any queries about the debt, our advisors will be happy to give you as much information as possible including meter readings and supply dates. They'll be unable to take any action on the account as this now needs to be initiated by Lowell. Hope this helps point you in the right direction bitemarx. get an sar running to eon BM. get the information ignore lowells for now. if the debt doesn't show then make SURE the address that the debt occurred at IS showing under your linked addresses on your credit file. if it does then this smacks that the debt is defaulted more than 6yrs ago and has been removed from your file as aged. I'll get the SAR ready, and send to EON. Not sure what reference number to put on the SAR> I only have the LOWELL reference number. CAn you ring Eon and ask them? Alternatively give them as much info as you can re addresses, type of fuel etc and see if they can find the account that way. you don't need any number to send an sar. Hello bitemarx and just a quick heads up about the SAR. Under recent changes to industry regulations, when customers ask for an SAR, we need to raise a Customer Rights Request. Once raised, we need to be back in touch within 30 days. We'll send you copies of the data on the account, including the bills, as well as any phone call transcripts we hold. There's no longer any charge for this service. As Bazooka Boo says, we'll be able to identify the account from the postal address for the old property. Please also include the reference number from Lowells. Hope this is of use bitemarx. Under recent changes to industry regulations, when customers ask for an SAR, we need to raise a Customer Rights Request. Once raised, we need to be back in touch within 30 days. What the heck is a Customer rights request and why should that mean anything to a person making a SAR request under the GDPR? especially, What has that got to do with delaying the 30 day countdown from CUSTOMERS request to the response required under the GDPR - if thats what your post means? More than happy to be enlightened regarding this .. Hold on, if it doesn’t show on credit file then this may be over 6 years? Find out if statute barred also. Hello tobyjugg2 and the Customer Rights I mentioned above is part of the structure we've set up to make sure we comply with all aspects of GDPR. GDPR covers more than just Subject Access Requests ( SAR). It also covers alternative customer rights such as the Right to Erasure, Right to Rectification, Right to Data Portability etc. We've set up a ring-fenced team to deal exclusively with all these requests. Any advisor can raise a Customer Rights request. It then goes to this ring-fenced team who need to be back in touch with the customer within 30 days of the request originally being raised. It could be quicker depending on what's involved. There's no charge for this. Previously, for an SAR, there was a £10 admin fee and we had up to 40 days from receiving a written request with payment to send the information. The new system will speed things up and make sure we're abiding by GDPR. Hope this explains tobyjugg2. Let me know if you need any more information as happy to help. As above, renegadeimp. The new system will speed up our response to these requests and make sure we're complying with the requirements of GDPR. If bitemarx asks for a Customer Rights request to be raised, this will kick-start our system so we can give them the information they need in good time. And as i said, its something your company made up to obfuscate the process. No other company does it. They dont need to make a rights request. When they request a sar, then you fulfil it. Not tell them to call again and raise a rights request. But as we always say on here, we have to at least give you a chance to show your willingness to help people. Sorry I wasn't clear renegadeimp. Customers don't need to call back. Where an SAR is required, please ask for this and the advisor will raise a Customer Rights request there and then. This will go to the ring-fenced team I mentioned who will sort it out within the timeframe I've outlined. This will be quicker and cheaper than before GDPR came in. Hope this explains a bit better renegadeimp and have a good weekend. SorryWhere an SAR is required, please ask for this and the advisor will raise a Customer Rights request there and then. This will go to the ring-fenced team I mentioned who will sort it out within the timeframe I've outlined. That is part of the point. A SAR is a legal request. 2. Customer asks for SAR. 3. EON (or whoever) complies with SAR request. How the heck is a customer supposed to know you want it worded a particular non standard way, and why should they either care or comply? I am tempted to send this to the ICO, just get their view on this. As always, corporations find a way to delay any just processes that are created to help consumers. I have sent off the SAR by post, first class recorded to EON. So LOWELL have been calling me almost every day, and sending me letters for this alleged debt. I'm waiting for a response to my SAR.